Almost every day of Chanukah this year we have learned of horrific atrocities committed across the globe in Sydney, Peshawar, Iraq, Syria; the terrorising of civilians, the murder of innocents, the degradation and enslavement of women. The one element that binds these acts together is that they are committed in the name of God and religion. People of pure faith are repulsed not just by the reprehensible actions committed by Islamist fundamentalists but by the fact that they defile faith itself by appropriating sacred language and symbols to serve their nefarious and profane objectives. Long ago the Rabbis were aware of just how destructive religion and religious symbols can be when aligned to nationalism, power and personal gain. The Hasmonean family that featured so prominently in the Chanukah story as heroes and liberators, quickly descended into corruption and violence while masquerading behind the pious symbols of the priesthood. For this reason the Talmudic rabbis, when framing the festival of Chanukah, deliberately sidelined the great Hasmonean military victories choosing instead to focus on the miracle of the pure oil. They had seen what happens when faith is aligned with power and deliberately drew attention away from this aspect of Chanukah. Faith, they seem to be saying, is represented not in the firestorm of military conquest but rather in a silent flame lit in purity and contemplated with humility. To make personal use of the sacred flames even for something as innocuous as reading by their light is to betray the sacred. Religion must never be appropriated for our own personal needs. Pure faith, like the stance we assume before the Chanukah lights, demands silence, awe, humility and gratitude. Murder in the name of religion is the extreme end of a spectrum that begins with infringing on the sacred by bending it to our own needs. 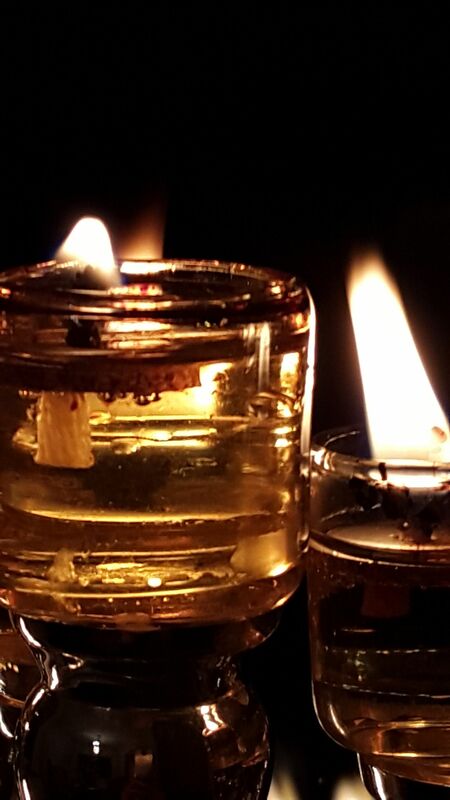 As we celebrate the last night of Chanukah and hope of shedding some light in our dark world we would do well to contemplate the purity of our faith. Is it gentle or aggressive? Humble or arrogant? Does it cause us to look up to others or look down on them? Does it lead to greater love and tolerance or hatred and intolerance? Does it make our world bigger or smaller? Are we using religion to further our own agendas; be they personal, social or national or are we standing in silence and awe before the sacred? Faith born of humility can transform our world for the better. Like the flickering flames of the Menorah, such faith enables us to see God’s world and all that is in it in a softer, gentler and more flattering light.